Horror films are supposed to scare us—heck, it's right there in the name of the genre, after all. The whole reason we line up to watch horror movies is to experience the safe thrill of being rattled, startled, and occasionally even downright terrified by fictional objects on a screen. It's all totally fake, of course—that's a big part of the fun—but that feeling of fright is very real. In fact, even from the comfort of a well-lit set making it perfectly clear that what's going on is just being orchestrated for the entertainment of millions, there have been times when horror movie scares have even managed to frighten the actors and actresses bringing them to life. Let's pay tribute to these brave souls by taking a fond look back at some of the times directors engineered scenes that actually scared the crap out of their performers for the sake of cinema. 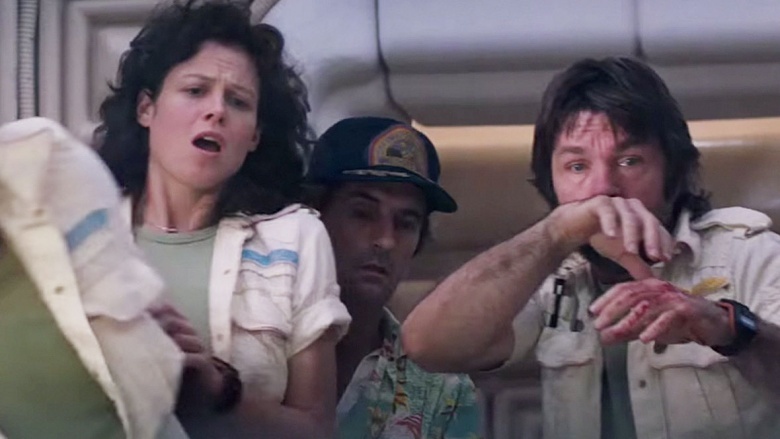 When that phallic alien burst out of the chest of the astronaut in Alien, it scared everyone, including the cast. Although, in 1979, the special effects sufficed to create the illusion of a creature violently exploding out of a human body, the real "magic" of this scene is how surprised and shocked the cast appears. These horrified faces are genuine. The cast had no idea the worm monster was going to pop out of their fellow actor's chest and splatter them all with blood and guts. John Hurt, the man whose innards are left on the faces of the unknowing cast, was taken aside during shooting and rigged up to a device loaded with the rancid organs of pigs. The rest of the cast was brought in unaware of the device about to spray them with pigs' organs, or why the film crew was wearing rain gear and protective plastic sheeting. The first take strategically brought the crew closer to the table by spurting only a small amount of fake blood, so when the next take left them all covered in the pig cocktail, their faces expressed true, terrified surprise. Several of the actors retreated to their dressing rooms to calm down, wipe the pig off their faces, and lower their blood pressure. The Fear of God, a documentary on the making of William Friedkin's The Exorcist, brought to light the filming antics of this director. His sadistic and entertaining ability to extract honest portrayals of horror and surprise from his actors includes refrigerating the exorcism room to make shivering and cold breath more believable or randomly shooting guns on set to keep the actors alert. 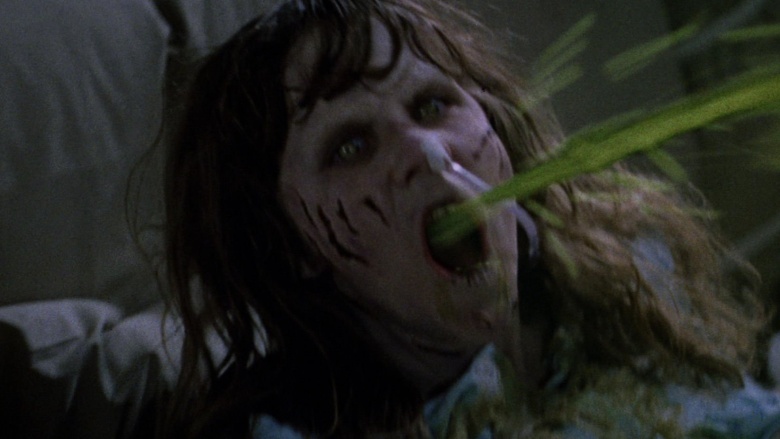 But it doesn't end there; the infamous vomit scene was a surprise to the actor Jason Miller. He knew there was vomit involved as the demonic young girl had tubes around her face to projectile her breakfast in bed in his general direction. He was told it would be aimed at his chest, but as we know, his face was blasted with lukewarm green pea soup. To the credit of Jason Miller, he finished the scene in one take but spent the rest of the day pissed. He doesn't like pea soup. The Texas Chainsaw Massacre (1974) is another example of a director strategically designing scenarios to elicit real terror from the actors and actresses. 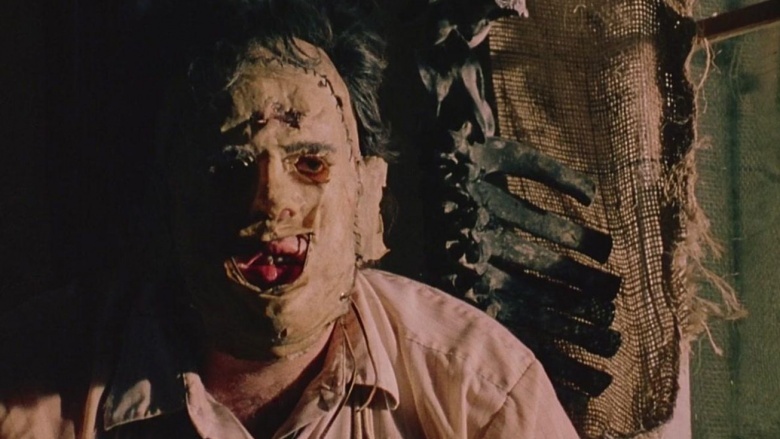 Tobe Hooper kept his star murderer, played by Gunnar Hansen, out of sight from the rest of the crew, so his mask would be a most horrifying surprise. Specifically, when Jerry is hacked to pieces in the kitchen, his high pitched squeal is absolutely real. 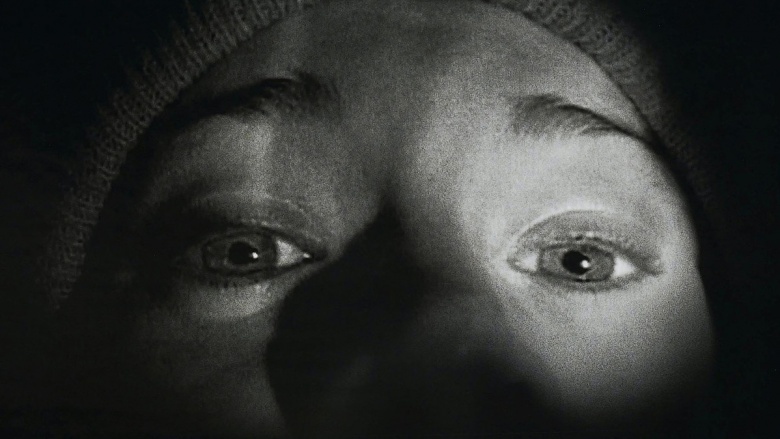 In The Blair Witch Project, the entire film seems to have been planned as an elaborate scheme to more slowly work the cast into the reality of a camping trip with friends that turns into a massive mistake ending in death. 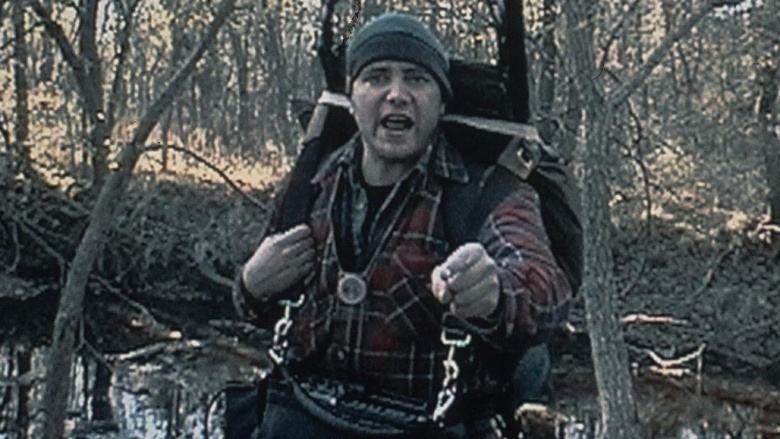 The directors gave the three cast members cameras, supplies for survival, and a rendezvous; from there, the three were left alone in the woods. A few scenes from the movie are from when they were actually lost trying to find the next meet up point. Often times the directors would secretly follow the cast and break sticks or throw rocks around the unknowing campers. Worse yet, the directors gave them less food everyday to make them ragged, angry, and more on edge. Then, when they fell asleep, they would sneak up to their tents and play recordings of children laughing and then intensely shake their tents. After eight days of filming, the cast no longer enjoys walks in the woods. Fool me once, shame on you. Fool me twice, shame on me. That's a lesson Kate Dickie learned the hard way working with Ridley Scott. By now, every actor in Hollywood knows about the infamous chestburster stunt in Alien, so you'd think they'd all be on red alert anytime Scott makes a monster flick. But the actors on Prometheus evidently thought the director's trickster days were over, allowing Scott to get in one more scare. 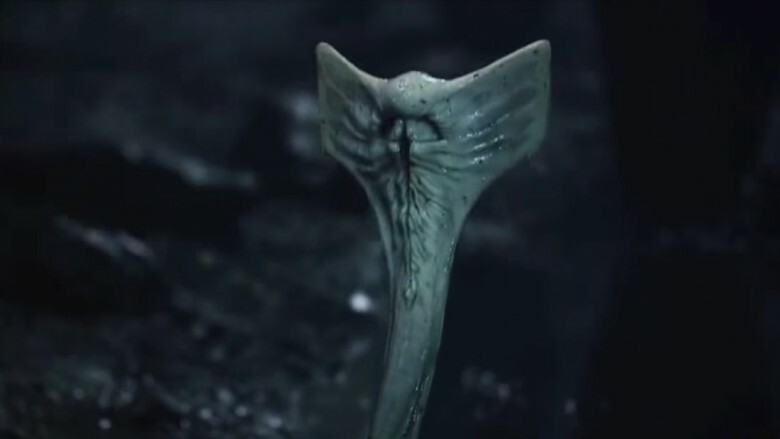 In one of Prometheus's more infamous scenes, a biologist with questionable decision-making skills (played by Rafe Spall) tries petting the world's scariest space cobra. This does not end well. In fact, it ends up with the Hammerpede crawling inside the scientist and killing him. A little later on, his comrades stumble across his corpse, and when they turn his body over, the monster shoots up out of his mouth. The characters freak out, and–as you've hopefully guessed by this point–their screams are genuine. Pulling pretty much the exact same stunt he used over 30 years ago, Scott replaced Spall with a dummy, loaded the Hammerpede puppet in its mouth, and connected the alien creature to a wire. He then told everyone on set to keep quiet and make sure the actors didn't see the storyboards for the day. So when actress Kate Dickie (who plays the ship's doctor) rolls the corpse over, a crew member yanked the monster out of the dummy's mouth, causing Dickie to yelp in alarm. Even tough guy Idris Elba, who was standing nearby, let out a squeal of surprise. Actors beware. Ridley Scott is out to get you. Whenever Jack Nicholson plays a bad guy, you know you're in for a pretty scary ride. That's doubly true for any actors sharing the screen with this cinematic legend. Nicholson has been described as "a force of nature," and while working on Martin Scorsese's gangster drama The Departed, he did a particularly good job of keeping his co-workers on their toes. Evidently, the man was improvising like a demonically possessed Robin Williams, and according to Leonardo DiCaprio, all of that ad-libbing "makes you terrified as an actor, and it ups the stakes." Especially when he starts pulling out weapons. During one intense moment in the movie, DiCaprio's undercover cop is confronted by Nicholson's mob boss. However, filming the scene was actually kind of difficult. Nicholson supposedly felt that DiCaprio wasn't scared enough, and Scorsese seemed to agree. So the director encouraged Nicholson to do anything that would "put [DiCaprio] on edge." With Scorsese's permission to go nuts, Nicholson assembled a crazy collection of props, including a fire extinguisher, a whisky bottle, matches, and a pistol. Now, while a prop man warned DiCaprio that Nicholson was armed and dangerous, it didn't make him feel any better when the veteran actor shoved a handgun in his face, and DiCaprio's look of alarm is genuine. "Leo's reaction is in real time," Scorsese confirmed, and as DiCaprio elaborated, Nicholson's stunt "changed the whole dynamic of the scene." But hey, that's just a normal day in the office when you're working with Jack Nicholson. Spend a time memorizing your lines, do a little acting, and hope he doesn't shoot you in the face. Directed by Fred Dekker and co-written by Shane Black, The Monster Squad is a unique '80s movie that pits a group of kids against some of the most famous monsters in cinematic history. There's the Gill-Man, the Mummy, and the Wolf Man, but of course, the scariest of the bunch is the bloodsucker himself, Count Dracula. Played by Duncan Regehr, this Transylvanian vampire wants to get his undead hands on an amulet that will help him conquer the world. However, standing between the count and unlimited power is one 5-year-old girl. Played by actress Ashley Bank, Phoebe Crenshaw is a little kid who winds up with the amulet in the film's climactic showdown. As the heroes battle it out with the monsters, Dracula approaches the girl, lifts her up by her chin, and angrily demands she hand over the all-powerful jewel. The count then reveals his red eyes and pearly whites, causing the 5-year-old to scream in terror. While it works perfectly for the scene, the young actress really was afraid. It was the first time Bank had seen Regehr in his full vampire regalia, and the sight of those fangs caused her to freak out. Moments later in the film, a portal to another world opens up, sucking in the monsters and any unlucky bystanders. To create this effect, the director set up around six gigantic fans, and all that wind provided a bit of a challenge for Bank. As she explained to Jason Norman, author of Welcome to Our Nightmares, Bank only "weighed about 40 pounds," and even though she was tied in place, the terrified tot "began clutching the grass" because she felt like she was "being blown away." It seems like making The Monster Squad might have been scarier than watching the movie. Believe it or not, some of the very best scenes in The Godfather happened in the spur of the moment. For example, remember Vito Corleone's cat? Well, Francis Ford Coppola just found that feline wandering around the studio and decided to put it in the scene. And according to Vanity Fair, when Clemenza quips, "Take the cannoli," the actor made that up on the spot. Marlon Brando was also thinking on his feet, as well. When Vito slaps Johnny Fontane across the face, that was Brando trying to shake up actor Al Martino and put some life into the scene. The legendary method actor was also doing a little improv in his dramatic death scene. Moments before Vito Corleone drops dead, he's playing with his grandson, Anthony. The 3-year-old was played by Anthony Gounaris, and obviously, toddlers aren't exactly natural actors. Since Brando was totally in charge of the scene and needed to connect with the kid, he famously put an orange peel in his mouth and began growling like a monster. But this didn't sit well with poor Anthony. The traumatized boy immediately started to cry, forcing Brando to drop the game and comfort the kid. It's a nice touch to a sad little scene, a unique moment of improvisation that makes The Godfather one of the all-time greats. It's pretty much impossible to do anything better than Shakespeare, but director Akira Kurosawa comes pretty close in Throne of Blood. Inspired by Macbeth, this samurai story tells the tale of Washizu Taketoki, a general who kills his lord and takes control of his master's castle, only to find himself in a prickly situation when his men rebel and fill him full of arrows. It's one of cinema's greatest death scenes, and it probably would have made old William "green-eyed" with jealousy. But while we can't say for sure how the Bard would've reacted, we know the scene made Toshiro Mifune scream for his life. Mifune was Kurosawa's leading man, and the actor played the villainous Washizu. But since they weren't using CGI back in the '50s, Mifune had to deal with actual arrows. Kurosawa and Koichi Hamamura, the prop master, brought in skilled archers and had them shoot needle-tipped arrows at the actor. During this incredibly tense scene, Mifune wore boards beneath his samurai armor, keeping him relatively safe as the arrows—guided by wires—"plunged" into his body. But the archers were also firing shots all around the actor, hitting the wall behind him as the actor ran back and forth, trying to escape. Understandably, the look of terror on Mifune's face is completely genuine. But it gets so much worse when you realize Mifune had to do multiple takes, each time avoiding several fatal blows. Are you surprised that Mifune went out and got hammered after the scene was over? Can you blame the poor guy? There's an old adage in Hollywood: "Never work with animals or children." And while that proverb might be true for lesser directors, Steven Spielberg doesn't give it the time of day, especially when it comes to kids. Spielberg has gotten some truly great performances from child actors in E.T. the Extra-Terrestrial, Empire of the Sun, and The BFG. And then, of course, there's his very first alien flick, Close Encounters of the Third Kind. While Richard Dreyfuss is the main character of Close Encounters, Cary Guffey steals the scene every time he shows up. The adorable 4-year-old played the part of Barry Guiler, the little boy who's abducted by aliens, and all his reactions seem so genuine … and that's because they are. Throughout shooting, Spielberg was constantly coming up with ways to encourage Guffey's performance. For example, in the scene where the boy is smiling out the window at the UFOs, Spielberg is off-screen, unwrapping presents for Guffey. Later on, when Barry tearfully tells his alien friends goodbye, he's really crying because Spielberg told him to imagine his friends leaving forever. But perhaps Spielberg's most ingenious ploy comes earlier in the film, when Barry runs into his kitchen and spots the alien rummaging through his refrigerator. The space invaders are kept off-camera, and the whole scene plays off Barry's face. In a matter of seconds, we see the boy go from fright to joy, but what is he actually looking at? Well, Spielberg had makeup man Bob Westmoreland dress up as a gorilla and hide behind a cardboard partition. When Guffey ran into the room, the partition was pulled away and he was face-to-face with a scary ape. Spielberg described Guffey as "a deer caught in the car headlights," but then the director told Westmoreland to take off his mask. Suddenly, Guffey recognized the makeup man and broke out into a big smile. "Even though it was a trick," Spielberg said, "the reaction was pure and honest," which really, is a phrase you could use to describe almost every Spielberg film ever made. There's no denying that Willy Wonka and the Chocolate Factory is a childhood classic, but honestly, it's one of the freakiest films ever made. And really, that's all thanks to Gene Wilder. Sure, his version of Wonka is hilarious and even (occasionally) soft-hearted … but there's just something off about the guy. Wilder plays Wonka like a psycho about to snap, and you never know when he's going to truly lose his mind. Of course, we're not the only ones who found Gene Wilder's maniacal candy man frightening. As it turns out, the frizzy-haired actor also terrified his young co-stars. You see, while working on the film, director Mel Stuart liked to keep all the kids guessing, hiding key details from them until it was actually time to shoot a scene. For example, Stuart kept the actors away from the famous Chocolate Room until he was ready to roll the camera. So when Charlie and company step into Wonka's wonderland, their looks of awe are genuine. But then there's the infamous boat scene, widely regarded as the scariest part of the film. According to Paris Themmen, who played Mike Teevee, Stuart didn't tell anyone what exactly was going to happen during that boat ride. So when Wilder started going on about hurricanes blowing and the grisly reaper mowing, the kids were scared out of their minds. Actress Denise Nickerson, who played Violet Beauregarde, actually thought Wilder had gone mad. Really, that's a testament to Wilder's acting abilities, and while he's appeared in several other iconic films, it's safe to say he'll always be best remembered for this candy-coated creepfest.